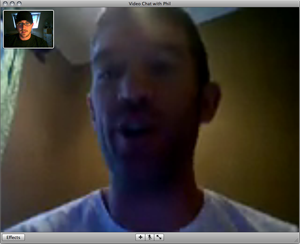 This afternoon I had a quick iChat (I say quick because my net isn’t cooperating with me as of late! Sorry Phil! UPC needs to get a phone call from me!) with my pastor here in Prague, Phil, who is still in the States for a couple of months raising support, seeing fam, and chilling a bit. I was so happy to know that as he was talking to me on his brand new MacBook that was on his lap! Yah! Who’s next?